Nothing was typical about the way the Carr Fire tore into the city of Redding, California on July 27. Photos released by the city late last week show an aerial perspective of the devastation caused when it launched its deadly assault on the community of about 100,000. The big picture: This wildfire transformed from an intense blaze to something even the most senior firefighters had never seen before: a towering, spinning inferno that sped downhill, tore across small, outlying subdivisions and towns, and torched parts of the city. Photos show entire homes charred down to the foundation, next to homes that survived as if untouched by the flames. The details: The Carr Fire's behavior on July 27 has stunned meteorologists who specialize in fire weather. It's long been known that wildfires create their own weather, pulling in air from surrounding areas, lofting it to great heights, occasionally even spawning thunderstorms from the towering smoke plumes. However, the Carr Fire was different. It occurred on an extreme day when conditions for unusual wildfire behavior were at a peak — with record dry vegetation, record hot temperatures and fickle winds. In the late afternoon, with temperatures north of 100°F, the fire formed a vortex. On video, it looked like a glowing, orange tornado, that post-storm damage surveys have shown contained winds of at least 143 miles per hour — equivalent to an EF-3 tornado. 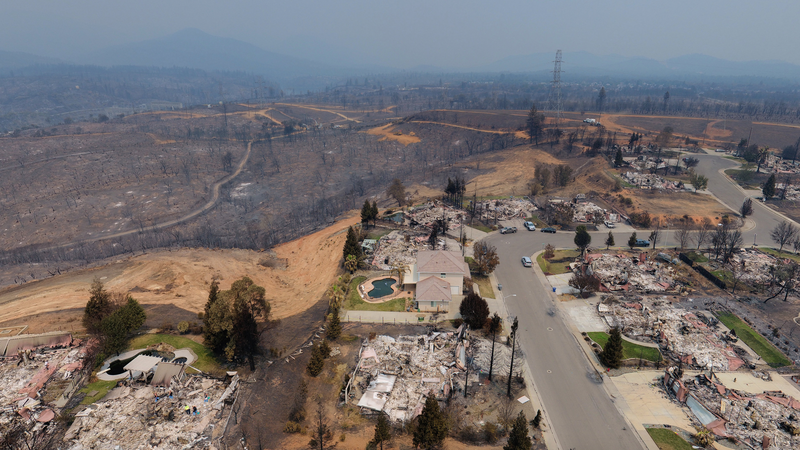 The images, taken by authorized drone operators, show what happens when you combine the capriciousness of a wildfire with the fickle fate dolled out by a fire tornado. In addition, the photos make clear how successful firefighters were at protecting many more structures from burning. The damage: The speed of the fire's advance and its devastating winds helped turn it into such a deadly event, overtaking a woman and her two great-grandchildren, as well as a firefighter as it advanced into Redding. A total of 8 people have died as a result of the Carr Fire, which was 55% contained as of Saturday. A staggering 1,077 homes, 22 commercial buildings and 500 other structures have been destroyed by this blaze so far, according to Cal Fire. The bottom line: The Carr Fire is the 10th-largest and 6th most destructive wildfire in California history, and with continued hot, dry weather in the forecast, it may continue to fester well into September. In general, climate change is multiplying the fire danger that was already increasing in California and other parts of the West due to decades of fire suppression policies and the construction of homes and businesses in areas that typically see fire activity.